There are certain television and radio commercials with which I can identify from when I was a child. Even today, when I hear certain melodies, they take me back through the years. 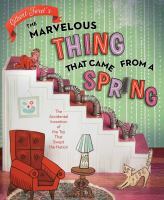 A recently published book, The Marvelous Thing That Came From a Spring (Atheneum), evokes that same nostalgia for me. Gilbert Ford wrote and illustrated this entertaining story whose subtitle is The Accidental Invention of the Toy That Swept the Nation. After Richard took a loan from a bank in order to produce his invention, he canvased Philadelphia, trying to convince toy stores to stock his new toy. He was repeatedly turned down, but he convinced the manager of Gimbels, a department store, to let him demonstrate his Slinky to holiday shoppers. The manager gave Richard one chance in November 1945. Richard had brought a board from home to serve as a ramp, and the shoppers were fascinated. Within ninety minutes, all of the four hundred Slinkys were sold. Gilbert Ford’s art for this picture book biography is as ingenious as the Slinky. His illustrations were drawn, colored digitally, and then printed. Ford then assembled these illustrations into dioramas that included found objects. They were then photographed by Greg Endries.